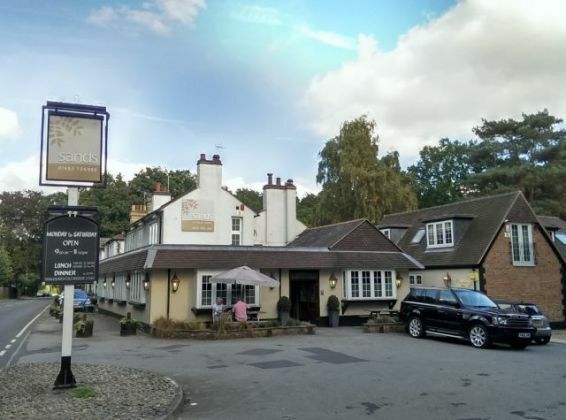 I was looking for a Sunday lunch in Surrey. A quick search online and I found Sands at Bleak House in Woking, just off the M25. They allowed children, and the price was right, so I booked for the following day at 12:30. Sands at Bleak House is located on a fairly busy main road in woodland. There seemed to be a few good walking paths close by the venue. We parked up in their large car park. We were immediately welcomed when we entered and shown to a large table with two high chairs (we were meeting friends). Fresh water was brought over, and drinks order was taken, which was a large bottle of sparkling water (I’m supporting Sober for October, the Macmillian Cancer initiative). We decided to have starters, with the view that desserts were an option. 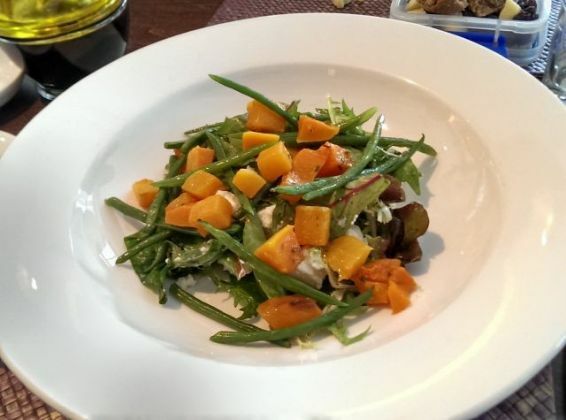 Claire and Phil ordered Butternut Squash Salad and Roast Pork. Abi asked for Chicken Caesar Salad and Roast Beef. I requested the Soup of the Day (Tomato and Basil) with the beef too. The venue was very nice – stone tiled floor, light coloured walls with lots of windows gave the venue a fresh and bright feel. The table was laid out for us, with flowers in a vase. Overall, the decor and cleanliness was very good. I was looking forward to this meal! Out came our starters. 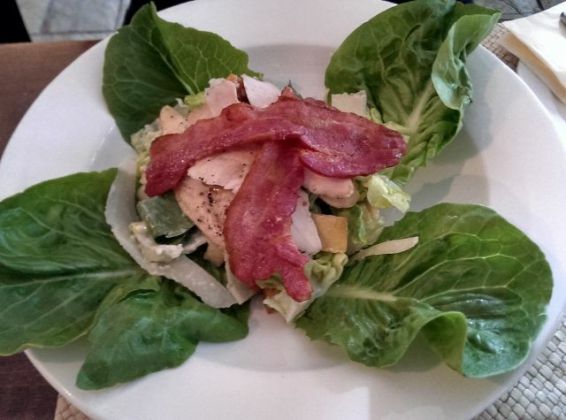 Each looked impressive, but I have to say that the Caesar Salad, with the huge strips of bacon, stole the show visually. Claire and Phil were both pleased with their Butternut Squash Salad. 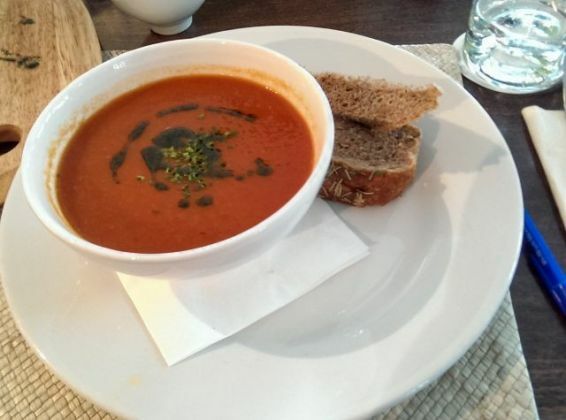 I haven’t eaten tomato soup for about 30 years, I am pleased that my embargo broke here instead of elsewhere – the rosemary crusted bread was delicious and I really enjoyed the soup. Definitely one I would order again. Oh, and a small bonus point – I was given a soup spoon instead of a standard dessert one. The beef was cooked to my liking, medium rare and slightly burnt on the outside. Claire was happy with the pork – she remarked especially on how nice the stuffing was. On to the roast potatoes. They were H-U-G-E. I personally feel the chef very talented to create roast potatoes this large, yet evenly cooked. 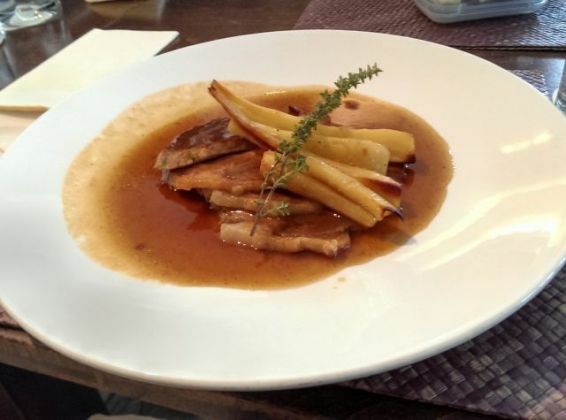 They were seasoned well and had (I think) a slight aniseed taste – perhaps fennel or star anise? Either way, they were enjoyable. The vegetables consisted of carrots, green beans, cauliflower and broccoli. All cooked to my liking (slightly al dente – ie not boiled to smush). The fact we could ask for more of each meant we all had enough vegetables and potatoes. The Yorkshire pudding tasted fresh and not too oily. Lastly, the gravy. A good amount, I would have preferred more but I’m sure we could have asked for extra – I was just too busy ploughing into the meal! After such an huge lunch, Claire and Abi decided not to have desserts. Whereas Phil and I, for review purposes only of course, ordered one each :-) He went for the Poached Pear Frangipane with cherry ice cream, I ordered the Lemon Meringue Pie. We also ordered a round of tea and coffee. 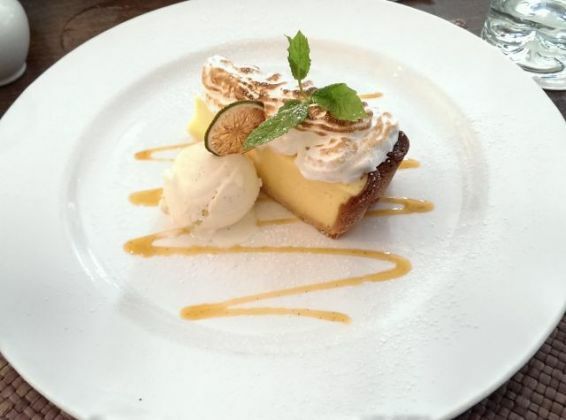 The lemon meringue pie was very nice – the sharpness from the lemons came through and the meringue provided a good sweetness. Claire sampled it and enjoyed the taste too (wishing she ordered one herself!). 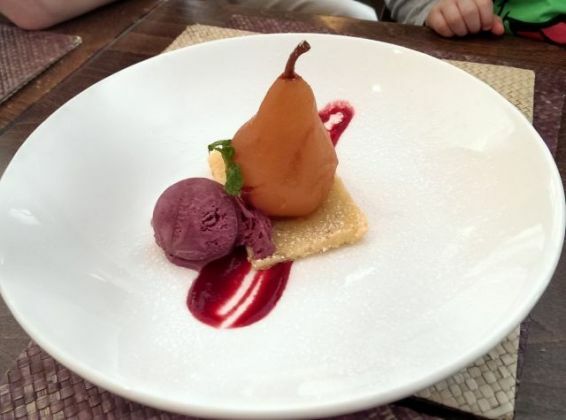 The poached pear looked fantastic, the cherry ice cream looking (and I understand tasting) so much better than when Claire ordered it from Kits Coty. The coffee topped the meal off nicely. 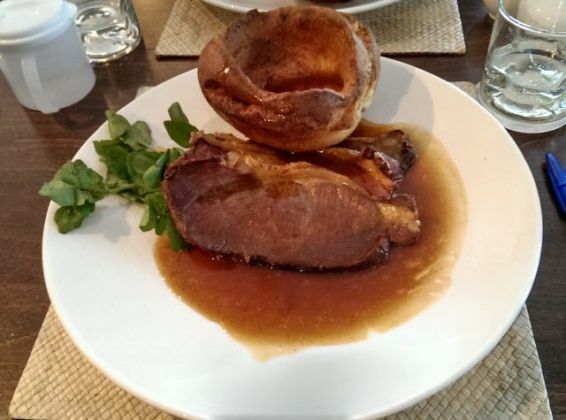 So, a Top Rated Best Sunday Roast at Sands at Bleak House in Woking – suitable for families and celebratory dinners especially.